And has been…for a couple weeks!! I just haven’t mentioned it because I haven’t done any work in it yet. The reason I haven’t done any work in it yet is because I just finished illustrating THE FICTION PROJECT! I am SO horrible with these things. Thankfully Art House Co-op will still take my book. It won’t go on tour, but that’s cool because that wasn’t the point of me doing the Fiction Project anyway. Since I’m terrible at most things having to do with paying attention, I didn’t realize that the sketchbook would be so much smaller than the fiction book. It has much better paper, though, and I am kind of excited about the size. Depending on my mood, I either have too much workspace or not enough. The size of the sketchbook is enough that I won’t be limited but also won’t be overwhelmed. It’s all good. 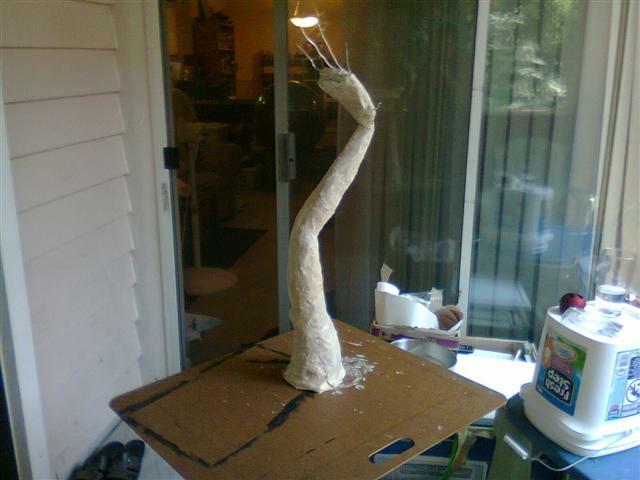 I haven’t finished my paper mache arm, yet. Things went awry in real life and I’ve not had a chance to get back to it. Soon, though. Soon. I need to see it finished and heft it about. One thing I did manage to nearly complete (nearly completing things is a big step for me) is a painting that my friend, A wrote a poem about. I wanted to give it to him, but first I wanted to touch it up. I managed to do that! I also varnished it and now all I need to do is ship it to him. That’s the part that I was supposed to do earlier this week, but that’s another thing that was tossed to the side when life hit the fan! Soon…very soon! That’s all I have for now. I’m not sure why but my head has been flooded with ideas and images that I need to do (I like to refer to them as “visions” because they feel like it, whether it’s when I’m dreaming or awake and they sort of flash in my brain and stick). Notepad has come in very handy for this. First I must ship out A’s painting. Then I must send the Fiction Project. Then I will get back to my own thing (the arm, the visions, etc…) while also working on the Sketchbook Project. All things will fall into place…they just have to. It has been quite some time since I posted. For a few months, I’ve been gradually spiraling downward in depression. It hit and it hit hard, but yesterday and today seem okay for the most part. I’m certainly not feeling my norm, but I’m hoping I’ll get back there soon. Anyway, I’m feeling well enough to do artwork and, really, that’s all that matters. Knowing these things about me, I sort of feel like I’m having a sordid affair by using paper mache. It feels good, though. I love messy and I love getting my hands thoroughly involved in what I’m doing. Paper mache lets me do that. 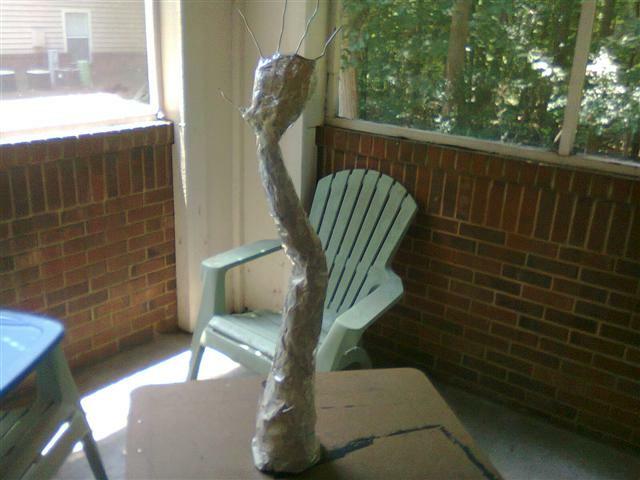 I get to enjoy the feel of sculpting at a much cheaper cost than clay! Back to work today – I took more photos yesterday that I will post later. My original intention was to keep the fingers and wrist flexible, but while working on it yesterday, I decided against that and formed the hand into a position that I found attractive.